Editor's Note: This Giveaway has ended. Thanks to all those who entered! It's that time of year again when fashion magazines produce September issues with hundreds of pages displaying Photoshopped young women in the latest fashions. As someone who loves clothing design and style, I look forward to flipping through an issue or two at the beach in August, looking for new fall fashion ideas. Two weeks ago, I sat with my toes in the water, looking at the thickest issue of them all. (You know which one I mean.) While I saw a number of fashions I think might be perfect on over 50 women, I honestly don't remember a single face of any of the models. Their chiseled cheekbones and flawless complexions just disappeared into the glossy pages, leaving no impression on me. 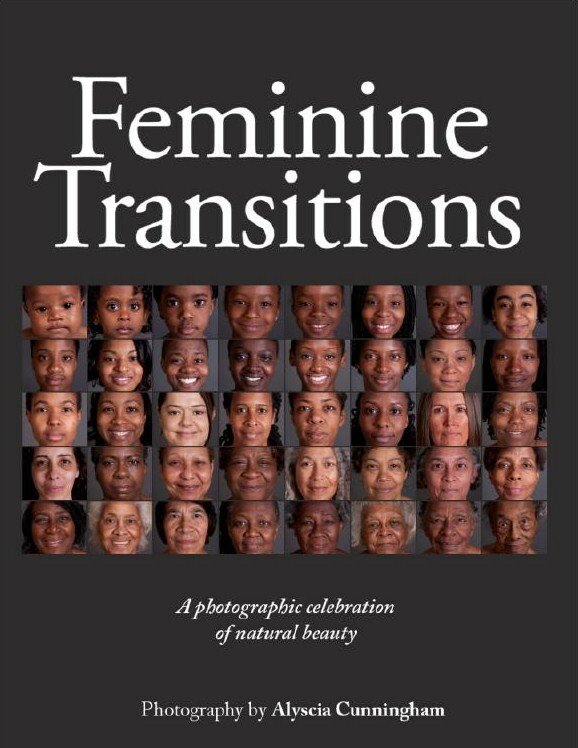 Soon after, I received an advanced copy of Feminine Transitions: A Photographic Celebration of Natural Beauty by author and photographer Alyscia Cunningham (A&C Books). The book is a collection of full-pages photographs of female subjects, from age 7 weeks to 103, photographed without makeup or accessories of any kind. These are honest, memorable portraits of women in their natural state. They depict the character and beauty of women at every stage of aging. Each portrait is accompanied by a lovely, inspiring reflection by the subject. Yesterday, I posted a review of Feminine Transitions. Now, the folks at A&C Books would like to give an e-Book copy of Feminine Transitions to a Flattering50 reader. One lucky Flattering50 reader will receive an e-Book copy of Feminine Transitions:A Photographic Celebration of Natural Beauty by Alyscia Cunningham. In an anti-aging society such as ours, Alysica says, “We must take responsibility for embracing our true selves. When we do, we will be helping the younger generation develop a healthier view of aging.” I believe Feminine Transitions is a perfect place to start a conversation about this important topic. It's a lovely book that grandmothers, mothers, daughters and their friends can share with each other. It's an opportunity to have an honest dialog about aging and the unique, natural beauty of every woman. ***This Giveaway is open to all Flattering50 readers. All entries must be received no later than Monday, September 30, 2013, 11:59 PM EST.